The Tamilnadu Physical Education and Sports University established by an Act of the Government of Tamilnadu in 2004, is unique and the first of its kind in India as an affiliatory University, exclusively for Physical Education and Sports. After obtaining the accent from his Excellency the president of India on 5th August 2005, the said act came into force with effect from 15th September 2005. It is a rare coincidence that the University has started functioning from December 2005, declared by the United Nations as International year for Sport and Physical Education. At present the University has four Faculties, eleven Departments and ten affiliated Colleges. Further the University now offers select Physical Education and Allied Courses, through collaborative programme and Distance Education stream also. Today Universities are considered as key institution in the process of social change and development and hence play a key role in societal transformation of the country and the world at large. 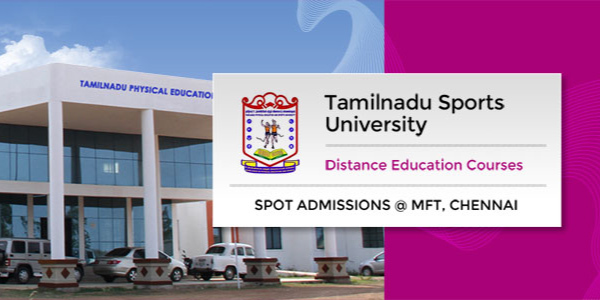 Distance Education system has grown exponentially in the last two decades in our country to meet the educational needs of the poor people at affordable cost.Tamilnadu Physical Education and Sports University is unique and first of it’s kind in the whole of our country offering innovative professional and alied courses at the undergraduate, post graduate, M.Phil and diploma levels. Its one of the most reowned institution of Higher Education,functioning with the objective of providing quality education to all segments of the society at the door steps of the needy. The University plans to offer quality Distance Education programme by providing state of art course materials in tune with latest technology. Further the University also plans to have a vast network of study centres thruoghout the country to provide quality service to the learners.